Manning the controls of a Cessna 172, Toby Brown sharpens his descent over Boomer Lake and continues west, lowering the wheels, fighting to steady the wings and go in for a smooth landing at Stillwater Regional Airport. Brown is playing a flight simulator in the College of Education's TECH Playground, a space dedicated to the latest in teaching technology and innovation. As Brown, the coordinator of the TECH Playground and a doctoral student in education technology, safely lands the plane, secondary social studies education faculty Shanedra Nowell watches over his shoulder. "I could use the flight simulator to teach land forms and geography," she thinks aloud. The TECH Playground, located on the third floor of Willard Hall, is enticing students and faculty to think about teaching and learning in new ways and sparking connections across disciplines. TECH stands for Transforming Education through Creative Habits. The flight simulator was shared with the TECH Playground by the aviation education program, yet as Nowell suggests, it can provide a new approach to help future educators teach geography. The TECH Playground is also home to a 3-D printer, a feature that draws attention from all visitors; and a Smart table, with a 360-degree surface, designed to engage young students. There is a 3-D television, a Smart board and various tablet devices. Smaller gadgets such as a LiveScribe pen, which records voices while the user writes and instantly converts written text into searchable computer texts, are also housed there. Visitors are welcome to bring their own devices and experiment with applications. "Our goal is to have tools in the TECH Playground that won't be widespread in classrooms for five more years," Brown says. "It's a revolving door of technology, and every year new tools will be added." Professor Susan Stansberry had long dreamed about a place where College of Education faculty and students could play with the newest and best technology tools and research the best applications to improve teaching and learning. Thanks to the leadership of College of Education Dean Pamela "Sissi" Carroll and the support of a gift from education alumna Jeanie Muzik Crone, the dream became a reality earlier this year when the TECH Playground opened. "It's about the ideas and bringing creativity and innovation to teaching in the classroom," says Stansberry, who coordinates the education technology program. "Learners want to be engaged, and technology is a vector." Educational technology is much more than hardware. The TECH Playground is meant to provide activities, tools and opportunities that are not available elsewhere on campus. It's a non-threatening, fun environment designed to build confidence and inspire its visitors. "ITLE (Institute for Teaching and Learning Excellence) serves our faculty so well with resources for specific software and teaching strategies. Our goal is to add the dimensions of creativity, innovation and opportunities for research," Stansberry says. Writeable glass panels cover the room's walls. Faculty and students are encouraged to list their curiosities, challenges and ideas about innovative teaching and learning. The starter question is, "What challenges do you see in teaching and learning?" Everyone who comes through the door is encouraged to share creative solutions and collaborate with others in the room, on a blog or through Twitter. 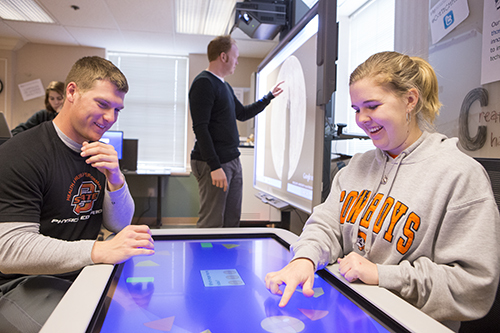 Education students Matt Mullins and Ainsley Bruton experiment with the TECH Playground's Smart table. "I am energized whenever I go into the room because the scene is always changing. The walls are covered with visitors' real questions about the learning process, and how technologies might help us explore it more deeply," Carroll says. One message on the glass walls reads: "Great learners are curious, persistent, questioning, not afraid to fail." "The TECH Playground encourages us all to be great learners," Carroll says. The playground is open daily during the week for visitors to walk in and spend time "playing." Nine sections of an undergraduate teaching with technology course regularly visit. "They haven't been afraid to write their ideas on the walls. We love seeing their ideas interacting with faculty ideas," Stansberry says. Many possible research projects that cross disciplines can cover the walls. "It has been encouraging to see how different disciplines are talking," Stansberry says. "These are conversations that might not happen, but we're finding out there are more commonalities than we realize. We are excited about the frequency of collaboration and hope it makes everyone better." One example of keeping up with the latest technology is the e-book used for the class, "Applications of Educational Technology." Books were expensive and the information was quickly outdated due to the constant introduction of new technology tools. "We created our own free e-book that is updated frequently," Stansberry says. "It's a living resource that follows (teacher education graduates) into the classroom. They continue to have access and share feedback from their experiences with us. We hope it can be used by schools for professional development." The TECH Playground has received a strong show of support from Crone, a 1973 elementary education graduate. She serves as vice president for the Education Development Corp. in Tulsa. "I understand the continued and growing importance of technology in school classrooms," Crone says. "(The TECH Playground) is a great resource in preparing teachers not only to use technology, but also to understand its impact on learning." Crone's endowment gift will help the college regularly purchase new technology tools for the TECH Playground. "When we spoke with Jeanie (Crone) and learned about her background in business and travel, including her current position in publishing books, we were convinced that she was one of those who is able to march two steps ahead of the band," Carroll says. "She is a visionary. Her commitment to education for Oklahomans is strong, and her gift will allow us to continually have cutting-edge technologies for faculty, students and staff to experiment with, learn to use and ask questions around. We appreciate her vision and her support in a very big and real way." The innovative space is certain to benefit creative teaching, learning and research habits of both students and faculty in the College of Education, and by extension, the thousands of future K-12 and university students they will teach. "We are excited about a paradigm shift from past ways of teaching and learning to new creative and innovative practices," Stansberry says. "We aren't kidding about transforming."